Remodeling a kitchen can easily cost tens of thousands of dollars. Between new appliances, cabinets, flooring, and countertops, it is understandable how quickly money can be spent creating the perfect kitchen. 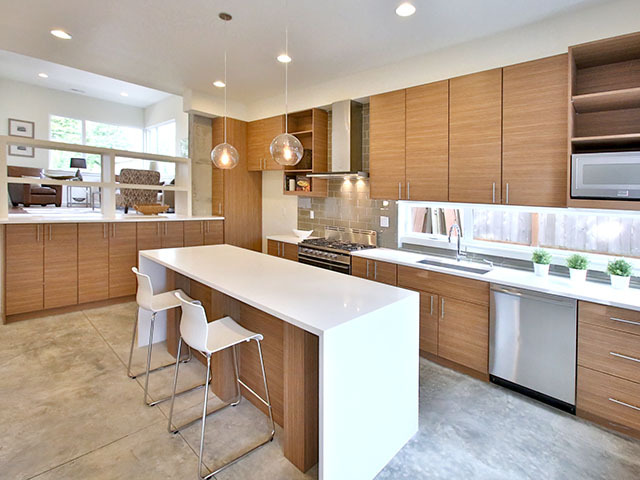 Luckily, Portland home builders have five easy tips as to how you can revitalize your kitchen without applying for a loan. Starting from scratch is not always necessary. A great way to save money is by finding existing elements within your kitchen that can work elsewhere or will feel new with a new coat of paint. Take the time to think about what truly needs to be replaced and what can be restored or reused. Also, utilizing local resources for used remodeling materials is a sustainable and creative way to save money and personalize your kitchen. Replacing cabinetry can be one of the largest expenses when remodeling a kitchen. Portland home builders recommend keeping those cabinets if possible. They made need nothing more than new fixtures and paint. Removing the doors from upper cabinets and turning them into display shelves can transform a kitchen as well. If you must replace your cabinets, consider saving with pressed wood interior shelves, or by replacing only the doors. A tile backsplash can instantly transform and update any kitchen. Self-adhesive tiles allow you to control the installation and save contractor costs. And Portland home builders advise creativity in tile placement. You can create a tile strip from your range to your fume hood in a bright color, adding bold impact to a commonly ignored area. Or consider alternative patterns and sizes in order to make your hard work a greater focal point. Great lighting makes a difference in any room of the home, but the kitchen often gets forgotten. Revitalize the kitchen with warm sconces, under-cabinet lighting, and LED lights within glass-front cabinets. Dimmers are also helpful in ensuring the lighting is always just how you like it. When updating any part of your home, it is easy to overspend on every element. When you begin your kitchen remodel, take the time to consider what is worth the splurges. Maybe your current appliances are inefficient. Or perhaps you have had the perfect granite countertops picked out for years. Whatever you ascertain needs the most help, Portland home builders recommend making that the main focal point of your new kitchen and budgeting properly so it can be done right. Looking for other great ideas in updating your home? Check out H. Hudson Homes on Houzz for modern design solutions.